Could smoking be snuffed out in downtown Providence? Dale Robinson, 21, said a ban wouldn’t stop him from smoking on the street downtown. PROVIDENCE — Across the street from the Rhode Island State House, right outside a mall downtown, two men on their lunch break begin to pack up. One puts out his cigarette; the other holds on for one last puff. And as the last orange speck flickers out, another lighter crackles a few feet away. In recent months, the strip along Francis Street outside the Providence Place mall has become a de facto smoking section for downtown puffers. First, the city banished smokers from parks. Then, more and more businesses started shooing smokers from their doorways, leaving smokers like Robert Black, who lit up outside the mall on Thursday afternoon, with an ever-shrinking list of places to go. Now, those remaining haunts may be going up in smoke. A former mayor — no, it’s not Buddy Cianci — wants to ban smoking from all of downtown Providence. And the president of the City Council has said he supports the prohibition. Some City Council members say the proposed ordinance is an answer to the unexpected consequences that arose after smoking in public parks was banned last year. With a $50 fine over their head, smokers dispersed throughout the city, congregating on sidewalks and outside local businesses. The proposed ban would aim to protect people from secondhand smoke and reduce litter from cigarette butts. Paolino, who owns several buildings downtown, said he suggested the legislation to the City Council because of an outpouring of complaints from neighboring businesses and tenants in his building who dodge a gauntlet of secondhand smoke on their way to work. Smoking is the leading cause of preventable death in the United States, and figures from the Rhode Island Department of Health show that in 2012 — the latest year for which data were available — 17.4 percent of Rhode Island adults smoked. “What we have now is just not attractive, it’s not healthy for people, and it’s not conducive to what we want Providence to be,” Paolino said. 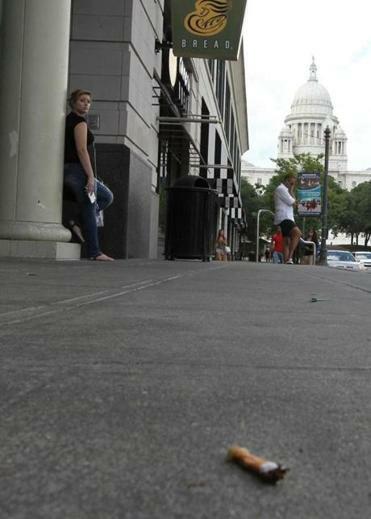 Under the proposal, smoking would be banned on streets and sidewalks throughout downtown, including the Providence Place mall, the Downtown Improvement District, city property in Capital Center and anything inside of North and South Main streets between the Roger Williams National Memorial and Transit Street. Smoking would still be allowed in homes and cars. Along parts of the path from the State Capitol to Kennedy Plaza, cigarette butts were wedged between the bricks one day last week, running into each other at right angles in a diagonal zigzag. “It’s like an outside tunnel of people smoking,” Paolino said about the area where people wait for buses in Kennedy Plaza, across from Burnside Park near the center of downtown. Black, who lives in Providence, said he stopped smoking in parks after the ban, and now walks a few blocks to Providence Place because the building where he works prohibits smoking within 50 feet. He called the earlier ban on smoking in parks “ridiculous,” but regards the broader prohibition being considered by the council as a violation of his rights. 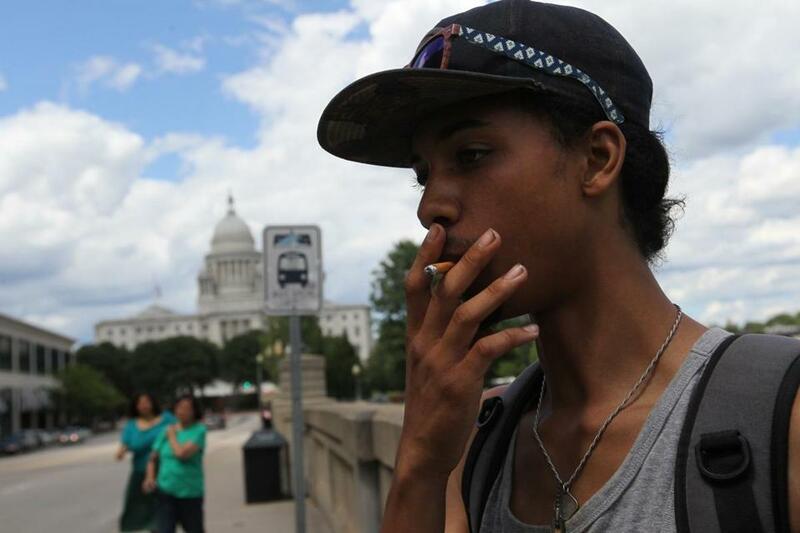 Dylan Harding, visiting Providence from Nashville, called the idea of a downtown-wide restriction “insane.” Besides, he said, smokers would probably light up anyway. Providence Mayor Jorge Elorza has not commented on the proposal. The ordinance is being reviewed by the City Council, which could amend it after a public hearing, possibly in September. Providence would not be the first city with a downtown smoking ban. Boulder, Colo., took a similar step in February, prohibiting smoking in the city’s business improvement district, an area in downtown covering several blocks. For Hassett, the proposed legislation is just a way make to sure smokers and nonsmokers respect one another’s space. While Paolino supports putting an antismoking cloak over downtown, Hassett prefers a modified version that would be a more strategic patchwork. He advocates keeping smokers at least 50 feet away from businesses, rather than a more sweeping ban. To help clean up the streets, his solution is simple: Add receptacles so people can throw away the remains of cigarettes.